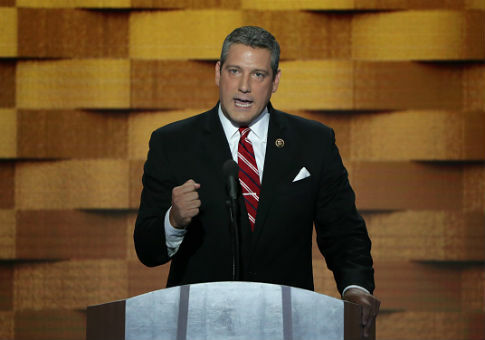 Ohio Congressman Tim Ryan is the latest Democrat to join the 2020 presidential race. Ryan, best known for an unsuccessful attempt to oust Speaker Nancy Pelosi (Calif.) from the House Democratic leadership, announced his run on Thursday via a new campaign website. The announcement came shortly before Ryan was scheduled to appear on ABC's The View. "Like so many in America's heartland, I come from a long line of factory workers who helped build our nation into a powerhouse of innovation," the website reads. "But over the last 20 years, failed leadership and broken promises have destroyed the middle-class, forcing our economy into crisis and pushing the American Dream out of reach." Ryan framed his decision to run for president around the issue he's dealt with while representing the working-class community of Youngstown, Ohio and its suburbs in Congress since 2002. "When our local GM factory was shut down last Thanksgiving, I got a call from my daughter who was consoling her friend whose father was an auto worker and was just laid off. My daughter said to me, with tears in her voice, ‘You have to do something,'" his site states. "That's why I am running for President. It’s time to do something." Ryan elaborated on his run and his appeal in a crowded Democratic primary during his segment on The View. The avid yoga enthusiast pitched himself as one of the only candidates that understood the "legacy" of post-globalization "job loss" and how it could be fixed. "In the last 17-18-19 years in public office, I've been working really hard to figure what the heck we do next," Ryan told the show's co-hosts. "I understand where we need to go. The country is so divided right now that we can't get a plan together." That plan, according to Ryan, would entail finding ways for America to "dominate" China when it came to domestic production in "growing new industries" like "wind," "solar," and "electric vehicles. " When pressed over similarities with his message and the one elucidated by President Donald Trump in 2016, Ryan said the difference was between "old school politics" and economic innovation. "He wants to go back to the old economy, he's talking about old steel mills and old coal mines. I'm saying ‘where are our kids going to work' and how do we come together," he said. The best of government, the best of the workforce, [and] the best of the free enterprise system and dominate the electric vehicle market so we are creating jobs." It is unclear how Ryan's message will play with Democratic primary voters. The congressman, however, is likely to face questions over prior comments he's made regarding key planks of the party's economic agenda. In August 2017, Ryan criticized Democrats for being too focused on income inequality by saying they could longer afford to be the "party of redistribution of wealth." Ryan leveled a similar criticism in March 2018 when he claimed the party's fixation on $15 minimum wage was "not speaking" to people's aspirations.